The Jonas Brothers are offering you the chance to hang out with them at one of their concerts through an auction benefitting Change for the Children Foundation. 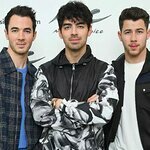 Lucky fans around the world will have their dreams come true when they meet Kevin, Joe and Nick during the 2009 World Tour. The winners will score a brief meet and greet, quick snapshot and four incredible seats to the show. Formed by the band, the Foundation supports programs that motivate and inspire children to face adversity with confidence, determination and a will to succeed. The auction is being run by charity auctioneers Charity Folks: for more info, or to place a bid, visit the Charity Folks website.